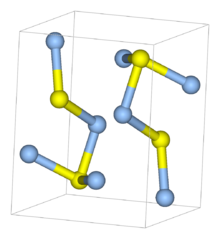 In mineralogy, argentite (from the Latin argentum, silver) is cubic silver sulfide (Ag2S), which can only exist at temperatures above 173 °C,  177 °C  or 179 °C. When it cools to ordinary temperatures it turns into its monoclinic polymorph, acanthite. Argentite belongs to the galena group. ^ a b Spencer 1911. This article incorporates text from a publication now in the public domain: Spencer, Leonard James (1911). "Argentite" . In Chisholm, Hugh (ed.). Encyclopædia Britannica. 2 (11th ed.). Cambridge University Press. p. 475. Look up argentite in Wiktionary, the free dictionary. Wikimedia Commons has media related to Argentite.